For almost a century, the photographers from the Aerofilms company recorded Britain from the air. Alongside the photographs taken of the great castles and abbeys of the country, the views also recorded industrial and commercial activity – including the docks and ports that were an essential part in maintaining Britain’s place in the world. In celebration of the publication of his book England’s Maritime Heritage from the Air, author Peter Waller tells us about some of his favourite images. The Royal Liver Building, Cunard Building and Port of Liverpool Building, Liverpool, 1997. © Historic England Archive, Aerofilms Collection. One of the most recent photographs in the book –taken in 1997 – this view of the Liverpool Pier head shows three stunning buildings that dominate the river bank at this point. In the foreground is Albert Dock; this area highlights one of the major problems faced by many of the traditional ports and harbours featured in this book: what to do with these historic sites once the trade upon which they depended disappears? In the case of the Albert Dock a vigorous campaign led to their preservation and regeneration. In contrast, to the north of the Royal Liver Building we see the derelict surroundings of a disused Prince’s Dock. The phrase ‘carrying coals to Newcastle’ is a cliché that has come to mean a pointless activity. The quantity of coal shipped from the River Tyne and the rest of the Durham and Northumberland coalfields, until comparatively recently, was massive, and most of it went by sea. The trade required the construction of specialist staithes – a landing stage for loading or unloading cargo boats. Among the most spectacular were those built at Dunston on the south bank of the River Tyne in the late 19th century. As traditional trades have declined, facilities such as the staithes have become redundant. Fortunately, however, despite fire damage, these staithes still survive and are now subject to a major HLF-funded restoration scheme. Once repaired, the largest wooden structure in Europe will provide a graphic remainder of an industry that was once central to the north-eastern economy. As the nation’s capital and, historically, the most important port in the country, London cannot be ignored. Of the views of the various docks in London, this is in many ways the most evocative. Taken in 1963, it emphasises how far upstream the docks extended – right up to Tower Bridge – and how relatively late traditional shipping made its way up the river. The beauty of aerial photography is that it allows the viewer to appreciate fully how much the landscape can be influenced by human endeavour. Just as the Liverpool & Manchester Railway was built to try and gain a competitive edge for the cotton manufacturers of the Manchester area, so the Manchester Ship Canal and the docks in Salford and Manchester were constructed to try and find a way around the perceived excessive rates charged by the port of Liverpool. For a period, the docks were the third busiest in Britain, but the increasing size of ships rendered them obsolete. Today, this view would be radically different, as the world of the dockyard has been replaced by the world of the media, with both the BBC and ITV having studios in the Salford Quays development. Alexandra Dock and Bentinck Dock, Kings Lynn, 1928 © Historic England Archive, Aerofilms. The fortunes of the country’s docks and ports has varied, with some declining, and others developing from small harbours into massive modern facilities. One which has seen a decline is King’s Lynn; in the Middle Ages it and ports like Boston were amongst the most important in the realm as they dealt with the trade to and from northern Germany and Scandinavia. As this trade declined and as the New World and the Far East grew in importance, so other ports – like Bristol and Liverpool – became dominant as they faced the Atlantic rather than the North Sea. The Victorian age, however, saw many of these traditional ports expand; they were never to regain their pre-eminence but provided an essential part of the country’s booming mercantile trade. The Port of Felixstowe, Felixstowe, 1997 © Historic England Archive, Aerofilms. If a single image could explain the demise of the traditional port, this is it. Over the past 50 years, containerisation has revolutionised the movement of goods worldwide. More and more freight is transported by sea on ever-larger container ships. Some traditional ports attempted to incorporate container-handling equipment, this was rarely successful. The large container ships required deep-water ports; as a result, Tilbury replaced many of the traditional docks in London, and Seaforth did the same in Liverpool. But the container trade is dominated by massive new developments such as Felixstowe – seen here – Southampton and the new London Gateway. HMS Amethyst (F116) moored off the Plymouth Breakwater, Plymouth, 1950. This image was marked by Aerofilms Ltd for photo editing. © Historic England Archive, Aerofilms. The warship as celebrity: HMS Amethyst was briefly the most famous warship in the world. Part of the Royal Navy’s fleet in the Far East, the ship was employed on the River Yangtse in China as a guard ship for the British Embassy during the Chinese Civil War in 1949. Attacked by the communist forces, the ship was seriously damaged and effectively held prisoner. Repeated attempts by the Royal Navy to undertake a rescue failed. Eventually, under cover, the Amethyst made a successful dash for freedom – an exploit that was eventually to be turned into a film (Yangtse Incident: The Story of HMS Amethyst) in which the Amethyst itself appeared shortly before being sold for scrap. The RMS Olympic and environs, Southampton, from the west, 1933. © Historic England Archive, Aerofilms. The Aerofilms’ photographers often recorded the great liners. These were the most glamorous means of transport of the day, regularly carrying stars of stage and screen across the Atlantic. Here the photographer has caught one of the greatest liners of them all – the Olympic. This was the sister ship to the ill-fated Titanic, famously lost during its maiden voyage in 1912, and to the Britannic, which was also lost at sea when in use as a hospital ship during the First World War. By 1933 the Olympic was approaching the end of its life but, four years before being scrapped, the classic four-funnel design still looks impressive in this view of the liner at Southampton. St Katherine Docks, Wapping, London, 1993. © Historic England Archive, Aerofilms. One of the most dramatic changes wrought to the traditional docks and ports of the country can be seen in this view of St Katharine’s Dock in London. Gone are the freighters loading and unloading at the quays, replaced by ranks of yachts and other leisure craft at their moorings. The growth of the leisure industry – as people have greater wealth and longer holidays – has been a factor in sustaining the viability of many of the country’s historic ports. Fiddlers Reach, M.V. Magdeburg disaster, 1964. © Historic England Archive, Aerofilms. The sea can be an unforgiving environment, as the countless wrecks around the country’s shores can attest, but it’s relatively uncommon for ships to come to grief whilst heading downstream towards the estuary. In 1964, the East German-owned MV Magdeburg was heading into the North Sea, having loaded a batch of British-built buses for Cuba, when it collided with a Japanese vessel heading upstream. The Magdeburg sank in shallow waters and was ultimately salvaged and returned to service, the only casualties being the buses. But was there more to the story… possibly- you’ll have to read the book to find out! 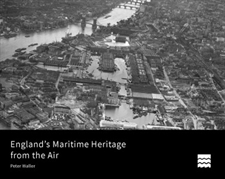 England’s Maritime Heritage from the Air by Peter Waller is available to buy from the Historic England Bookshop. You can see a preview of the book here. Reader Offer: use code EMH17 to get 20% off. Post and packing is free in the UK.